Payback by Michael FitzGerald is an alternative look at history. It’s 1938 and the world is on the edge of disaster. The FBI decides to attempt to stop a new world war by assassinating Adolph Hitler. They know America can’t be involved so they decide to make it look like it wasn’t a government job at all. Deciding to collude with the Mafia for help, they have absolutely no plan to claim responsibility. The Mafia offers up Benjamin (Bugsy) Siegel, a notorious hit man, totally aggressive and sometimes unstable. His nature makes him a dangerous, complicated element in the plan, but that can’t be helped. FBI agent Lugi Carmona, pretending to also be a Mafia hit man, enters Italy, along with Siegel, to carry out the assassination. Conning the Italian Mafia into thinking the target is their bitter enemy Mussolini, the pair must avoid rival gangs and the Italian police to avoid being caught and certain death before they can even get close to completing the job. Both are determined to succeed, but also wonder just what will happen if they achieve their goal. I enjoyed this story very much. Mr FitzGerald has researched and developed a strong cast of characters providing interesting flaws and strengths. There were surprising twists and turns found throughout the story. The plot was good, although the pace of the novel slowed at times, but when the action picked up it sped right along. I kept waiting for the last big twist, but although this didn’t come, the story ended on an interesting note. If you like stories of what could or might have been, then this one’s for you. Payback is an alternative history novel by Michael FitzGerald. It’s a novel filled with disaster and possibility that changes the course of world history. Payback is a ‘what if?’ novel based on some historical facts but which goes on to create a fictional story of an alternative history where a different future emerges. There were several assassination attempts on Hitler in real life during the 1930s but none of them was successful. 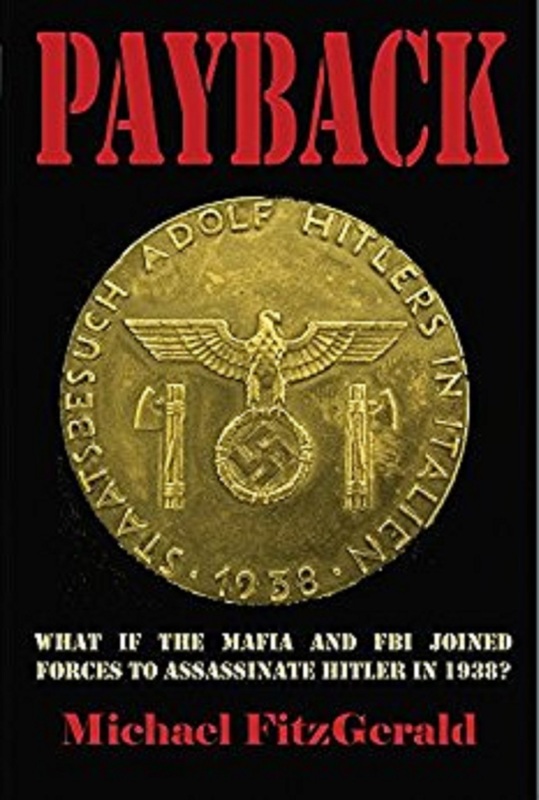 Payback imagines that the Mafia is approached by the US government to supply an assassin to work with an undercover FBI agent to kill Hitler in Rome. It is essential that the assassination appears to be the work of gangsters rather than a government-sponsored killing. What if Hitler had been assassinated before World War Two? Who would fill the power vacuum? Who would take over in Germany? How would Mussolini react? Payback involves two main characters, the Jewish gangster Bugsy Siegel and his FBI partner, Luigi Carmona. Siegel believes that Carmona is a gangster like himself and both men receive help from the Italian Mafia against their great enemy, Mussolini. They go to Italy to try and assassinate Hitler but lead the Mafia to believe that the target of their mission is Mussolini. Then things begin to unravel and become more complex and dangerous for them. The background to Payback is Hitler’s state visit to Italy in 1938. He has recently conquered Austria and the Czechoslovakian crisis is looming. War seems increasingly likely. The American Mafia, often called “The Syndicate” or “Murder Inc.,” is dominated by an alliance between Jewish and Italian criminal gangs. Two of its most powerful leaders are Meyer Lansky and Benjamin Siegel. Siegel, often known as “Bugsy” because of his mental instability, is a ruthless, reckless thug. He has never been a religious Jew but Nazi anti-Semitism makes him become more active on behalf of the Jews. Siegel, Lansky and other Jewish gangsters regularly storm pro-Nazi meetings in New York and break them up by force. Siegel has talked for years about wanting to assassinate Hitler. On one occasion Goering and Goebbels are staying at the villa in Rome owned by one of his mistresses. He wants to kill them on the spot but his mistress talks him out of it, pointing out that she and her husband would be arrested and probably executed. In 1938 the head of the American Mafia is Frank Costello. He, like most Mafiosi, is anti-Fascist. Mussolini has been cracking down on the Mafia ever since he came to power. Many Italian Mafia leaders are in prison or hiding out. Costello’s great rival Vito Genovese escapes to Italy. He presents Mussolini with a million dollars in cash – worth considerably more in today’s money. As a result the authorities turn a blind eye to the activities of the Genovese Mafia while cracking down hard on Costello’s followers. General Ludwig Beck was an anti-Nazi and the Chief of the General Staff of the German Army. In 1938 he genuinely contemplated a military coup if the Czechoslovak crisis had resulted in war. Payback takes these historical facts and weaves them together into an alternative history novel. It looks at how a successful assassination could have been carried out and looks at the likely consequences for German and world history if it had succeeded. Payback is a fast-paced, exciting, page-turner of a “what if?” novel. It has elements of suspense, pathos and humour to lighten the tension. Payback is great for alternative history fans as well as crime enthusiasts and those interested in World War Two. Payback is a fast-paced novel involving two assassins, the gangster Bugsy Siegel and an undercover FBI agent. They travel to Italy for Hitler’s state visit in 1938 to kill him, with additional help from the anti-fascist Mafia. In the aftermath of the assassination chaos ensues as the Nazi leaders are unaware of the dramatic changes taking place in Germany during their absence. Mussolini makes new plans of his own in the light of the events. Payback is available from Amazon and Barnes and Noble.